A little late, but I am never on time, I am either way ahead or way behind on everything so it fits that I am wishing you a happy new year a little into the new year. 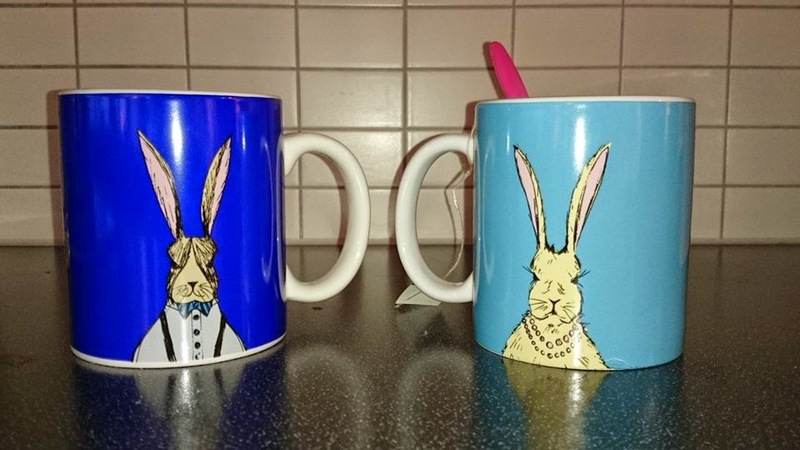 We got these lovely mugs from my cousin for Christmas and I LOVE them, looks just like boyfriend and me. This year we are buying a little more of our flat, I am contemplating a new phone and we bought a new iPad, or rather I did. Valmin seems happier lately, he is fat and hopping about. He flops next to me now, and binkies around at night doing the 500 lap with Mimle doing the same some time later. They love waking boyfriend in the morning jumping on top of him, while Mimle frantically tries to smoothen our duvet with boyfriend still in it. They are both spoiled rotten and will jump you for treats. Also they both come when I call their name... Probably because I = Treats. I have a finish, first thing this year. I used up some yarn I had left and made a small table cloth, Mimle and Valmin investigated. Both were unimpressed. I am thinking of using some more of the same leftover yarn in different colours to make more round table cloths and stitch them together with this one. I wonder if that will make a nice effect or not... We will see. Here it is all finished. Sorry for the bad pictures, the sun is not yet up here. Hej! You asked about the bunny chart. It is from the primitive jewel kit named White rabbit.